Between book events, working at Probation and workouts, things get hectic around our place. Maybe that’s why we’ve neglected to mention that the Gimme Shelter Campaign recently made our 2nd and 3rd official donations to the Linda Blair Worldheart Foundation and the St. Martin’s Animal Foundation. For new visitors, we’ve promised to donate 10% of the profits from GIMME SHELTER to various animal rescue groups. We’re at 3 and counting, so keep buying books and we’ll keep sharing the proceeds. 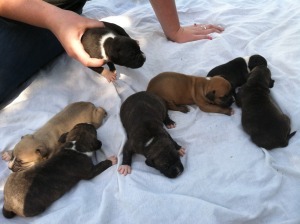 Pit-Lab pups being fostered by Sky Valencia of St. Martin’s Animals Foundation. With all of those cute kitty YouTube videos, it’s tough to keep current on dog news so here are two stories that might be of interest. – An L.A. Times‘ piece from June 22 detailed the protests by China animals lovers upset with mistreatment of stranded dolphins and the traditional Yulin dog meat festival. In a country not noted for its human rights concerns, it’s heartening to hear that people are willing to speak up about perceived animal cruelty. – The April issue of Scientific American ran a piece by Kate Wong outlining scientists’ theories that adaptation to humans starchy diet may have lead to the domestication of dogs and cats. I love Tanner but he is NOT getting my pizza! ← SPAY & NEUTER FOR L.A. PIT BULLS – FREE, and GOOD KARMA!